Wichita is the seat of Sedgwick County, and is the largest city in Kansas. 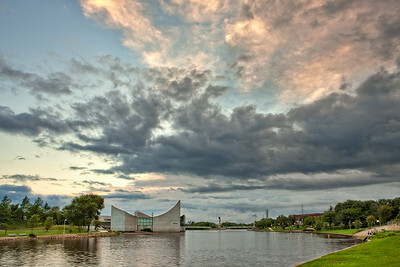 Exploration Place, a children's discovery museum, is one of Wichita's "Museums on the River." Sedgwick County, Kansas. June 9, 2014. 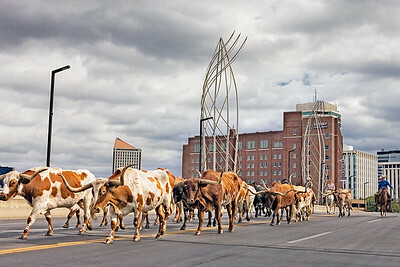 The streets of Wichita reverted back more than a century as the Kansas Livestock Association helped celebrate the state's 150th birthday by driving 30 magnificent Longhorn steers in the Kansas Sunflower Parade. The herd is crossing the Arkansas River on the Douglas Street Bridge. Wichita, Kansas. October 8, 2011. The Arkansas River in downtown Wichita is usually a six-foot-deep, bank-to-bank waterway, thanks to a dam just downstream. For the six months preceding this photo, the dam has been undergoing re-construction, so the Arkansas has resumed its "prairie river" configuration. Hundreds of cottonwood saplings have sprouted and grown eight feet in one summer. October 8, 2011. Wichita, Sedgwick County, Kansas. February 8, 2010. This spreading Mulberry was the final tree in Wichita's College Hill Park to show its fall coloration. 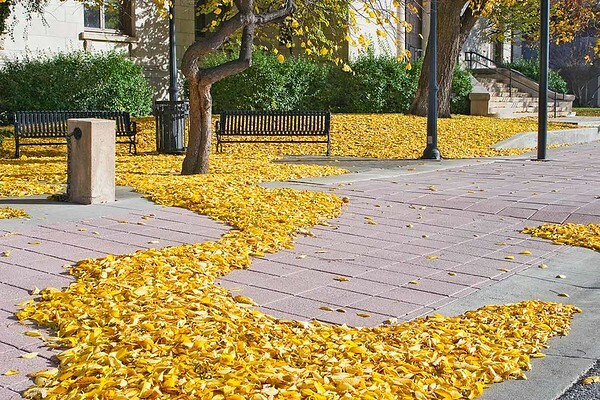 Over several days, the fallen leaves became a yellow carpet beneath the tree. 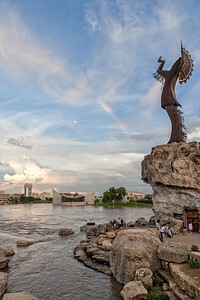 Wichita, Kansas. November 12, 2009. This spreading Mulberry was the final tree in Wichita's College Hill Park to show its fall coloration. 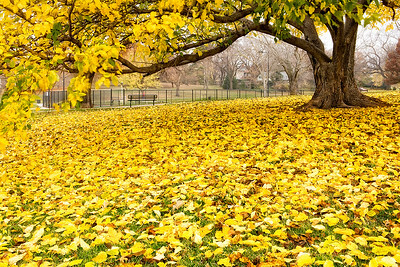 Over several days, the fallen leaves became a yellow carpet beneath the tree. Wichita, Kansas. October 21, 2009. My studio and gallery is in this building, three floors below. This thunderstorm sits twenty-five miles southeast of Wichita just after sundown. Atop the Grant-Telegraph building, Wichita, Sedgwick County, Kansas. June 16, 2009. Blackbear Bosin's Keeper of the Plains sits at the confluence of the Arkansas and Little Arkansas rivers. Wichita, Sedgwick County, Kansas. May 28, 2007. I liked the relationships of the interchange geometry with the lines of this Stearman biplane, manufactured for the U.S. Navy by Boeing in 1942. 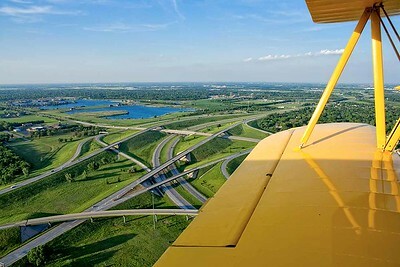 I-235/K96 interchange, Wichita, Kansas. May 14, 2007. 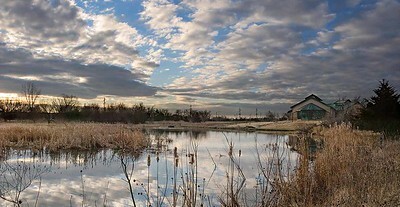 The Great Plains Nature Center, at 29th N and Woodlawn in Wichita, Kansas, is a cooperative partnership between the City of Wichita Department of Parks and Recreation, the Kansas Department of Wildlife and Parks, and the US Fish and Wildlife Service. In addition to the exhibits in the Koch Habitat Hall, the Center is home to 282-acre Chisholm Creek Park. Sedgwick County, Kansas. March 9, 2005. This view of the Wichita skyline is from a grassy berm alongside McLean Bouldvard near Exploration Place. The time is aobut 8:30 p.m. on a summer weekday, which accounts for the lack of traffic. August 12, 2004. This elm, in the College Hill section of Wichita, Kansas, is a great-looking tree in any season. 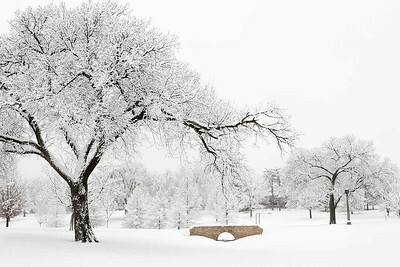 A Sunday-morning snowfall outlined its bones in a spectacular way. Wichita, Sedgwick County, Kansas. December 14, 2003. 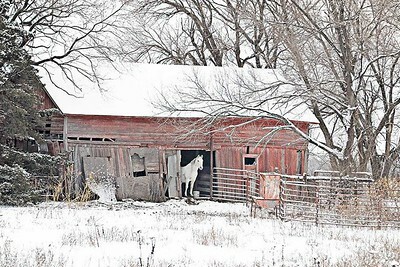 Driving down a rural Sedgwick County road on Christmas Eve, I caught a glimpse of this scene, turned around, and took a few hand-held shots. It is a favorite image. In suburban Wichita, Sedgwick County, Kansas. December 24, 2002. 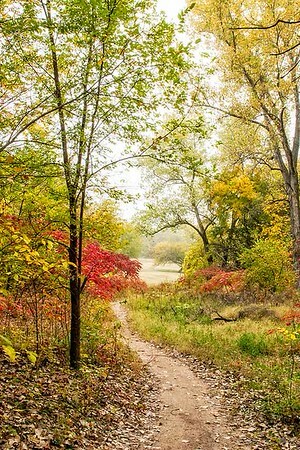 Besides wooded areas, Wichita's Oak Park contains long open stretches of lawn, lily pond, artificial springs and brooks, stone-curbed drives and inviting paths. Wichita, Sedgwick County, Kansas. October 21, 2002. As a loyal Kansan, I'm not too fond of those too-clever "We're not in Kansas anymore, Toto!" jokes, usually coming from folks who treat my state as fly-over country. Nonetheless, I couldn't resist the L. Frank Baum-inspired title for this shot. The photo is also testimony for keeping one's camera handy. While driving down Wichita's Main Street to my office, I passed these wind-sculpted yellow leaves covering the brick sidewalk. Wichita, Sedgwick County, Kansas. November 13, 2002.